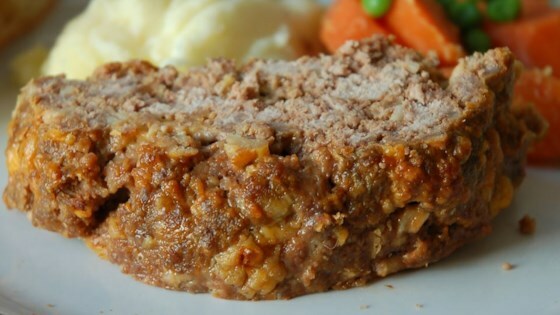 "Tired of boring old meat loaf? Well give this one a try. My husband won't eat any other meat loaf but mine." Stir the ground beef, crushed crackers, Cheddar cheese, and onion soup mix in a large bowl until well combined. Whisk the eggs, ketchup, and steak sauce in a separate bowl until smooth. Mix the eggs into the meat until evenly combined, if the mixture seems too dry, add a little water. Press into a 9x5 inch loaf pan. Bake in preheated oven until the meatloaf reaches 160 degrees F (71 degrees C) and is no longer pink in the center, 45 to 60 minutes. This family favorite is loaded with flavor.